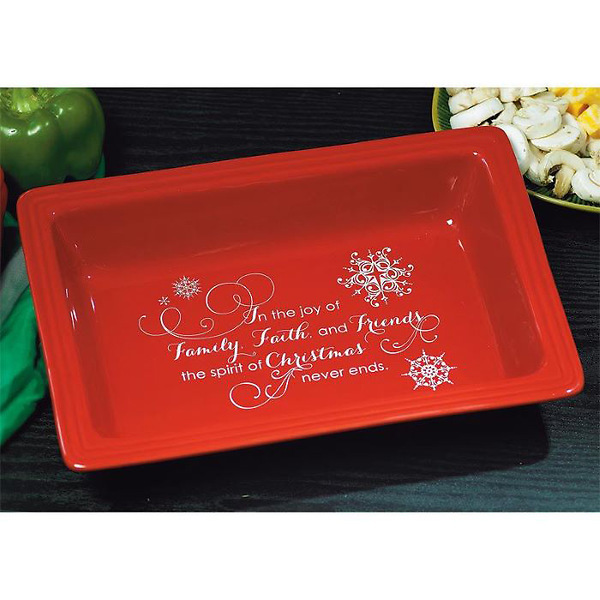 Unique dish features a seasonal sentiment at the bottom and is sized to fit casseroles, cakes and other favorite recipes. Made of oven/microwave/dishwasher safe stoneware. Measures 13'' x 9'' x 2'', interior dimensions 11 1/4'' x 7 1/4'', packed in styrofoam and protective white box. Inside dish reads: In the joy of Family, Faith and Friends the spirit of Christmas never ends.